Every interaction you have is significant. 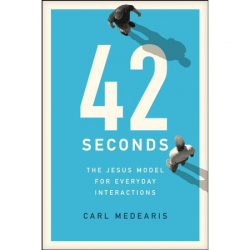 Forty-two seconds: That's the average length of Jesus' conversations as recorded in the Gospels. Of course not every conversation Jesus had was written down, but this glimpse into his interactions makes one thing clear: In those brief connections - like the ones we have every day - Jesus deeply and eternally impacted people's lives. As we examine the simplicity of Jesus' discussions, we, too, can learn to talk to people like Jesus did - connection in natural, meaningful ways. Read 42 Seconds as an inspirational primer or a four-week devotional that teaches you how to be like Jesus in your everyday interactions with those God has placed in your life. Do I Believe What Jesus Believed? Do I Really Know Jesus? Do I Do What Jesus Did? Do I Live as if Jesus Matters More Than Anything? Chapters 1-5 The Final Word: "BE Kind"
Chapters 6-10 The Final Word: "Be Present"
Chapters 11-15 The Final Word: "Be Brave"
Chapters 16-20 The Final Word: "Be Jesus"
Epilogue: The Final, Final Word.